Aquaponics is quickly gaining popularity as individuals, entrepreneurs, educators, missions and governments realize that aquaponics can provide both fish and vegetables from one system, while using minimal resources. Aquaponics can be done in a small space, providing fresh local food that is free of pesticides and herbicides. Researchers studying aquaponics turned the concept of raising fish together with plants into a science. Nelson and Pade, Inc.®, turned aquaponics into an industry by offering science-based Clear Flow Aquaponic systems®, comprehensive training courses and design and tech support services. Nelson and Pade, Inc.® can help you get started in your aquaponics venture. Check out the workshops and events at Nelson and Pade, Inc.®! 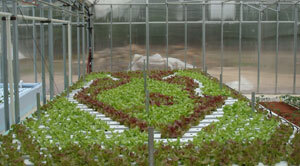 This page has a wealth of information on aquaponics. Whatever your application, from hobby to commercial, you will find great reading here.